On Friday, during the van ride down to Rhinebeck, I knitted the 2nd sleeve. On Friday night, I sewed the sleeves to the body over margaritas. I also bought some yarn. More about that tomorrow. There’s some more knitting and drinking to be done first. Hurray for knitting weekends! OMG! That looks awesome! Can’t wait to hear all about your Rhinebeck adventure. AWESOME!! Sounds like a fun time. That sweater is just beautiful. I’m envious of anyone at Rhinebeck. I wanted to make a visit back, but it wasn’t in the cards. Hopefully, next year. Looking forward to reading about the rest of Rhinebeck. That looks great, and YOU look fabulous! HOpe you have a great time, I can’t wait to hear all about it! You look simply *smashing*! 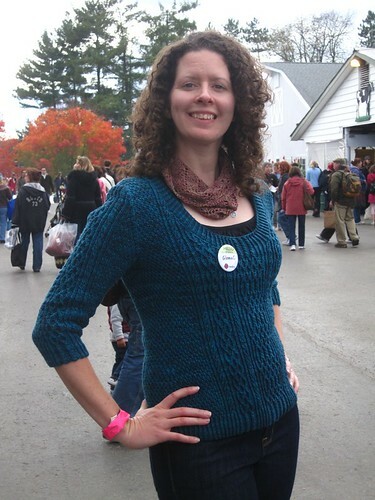 😀 Awesome sweater, triumphant Glenna, and what looks like a gorgeous fall day in New York for fondling yarn. I need to make a better attempt to get to my local wool festival this spring. In the meantime, I shall live vicariously through your posts! What perfect timing for a gorgeous sweater. It fits you perfectly! Looking forward to hearing more about your weekend. It looks GREAT! That sweater looks lovely, congrats! Lovely sweater. I want to make one! Just beautiful! What a beautiful combination of cables that manages to be slim rather than bulky! Most cable patterns make me feel like a linebacker, but your design has so many nice vertical lines. Can’t wait to hear more about Rhinebeck. That is so, so beautiful! Looking absolutely lovely! Wish I could have told you in person! Brilliant last minute sprit too! Too fantastic! I love that sweater! Were the Margaritas with Steph, Jaya, Laura, Beth, Michelle, Hope, Vanessa, Jen et al? I was supposed to be there, grr…..I wish I had been to ooh and aaah at the sweater, it’s fabulous! Gorgeous. And the sweater is lovely, too! 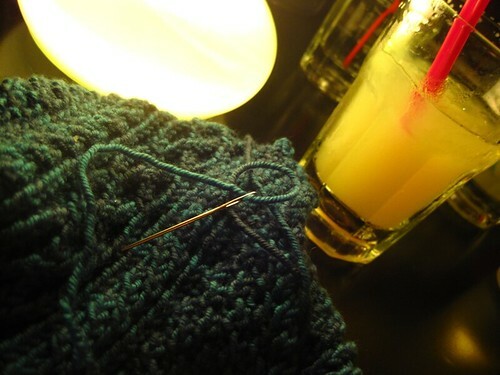 margaritas and seaming- there’s a great combo!! you look fantastic in your Royale!! Lovely sweater! Very jealous about Rhinebeck, never been able to make it. Next year, I swear! If knitting is a passion of yours or you are just generally interested in knitting and knitted outcomes then you are a perfect candidate! Very awesome! And amazing that you could seam sleeves to body over margaritas! I just stumbled onto your site and noticed this sweater. It’s gorgeous! I just started knitting and love your site. I will keep coming back for inspiration and information. Thanks! Just found your blog and I’m hooked already. Great sweater. Lovely colour too!